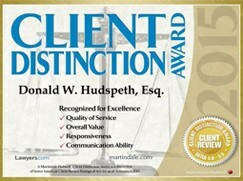 Phoenix Business Attorneys, Contracts Transactions & Disputes - Law Offices of Donald W. Hudspeth, P.C. Practical business experience — In his early career, the firm’s founder Donald W. Hudspeth enjoyed success as a small business owner. Our firm’s other attorneys also have hands-on business experience. Practical legal experience — For more than 20 years, we’ve been helping small-to-medium sized businesses achieve success in Arizona, nationally and internationally. Authoritative knowledge of business law — Mr. Hudspeth has served as Professor of Business Law at Arizona State University and has conducted classes and seminars at several educational venues. 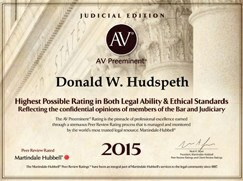 Mr. Hudspeth initiated the radio programs “LawTalk” and “Law on the Edge,” and has been published on a variety of legal issues. 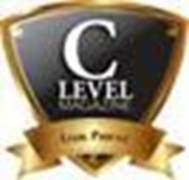 We understand your needs and focus on your goals as we help you start a new business, prepare a contract or negotiate a dispute. Business law — We handle matters related to contracts and transactions for any type of enterprise. Our vast experience includes construction, entertainment, intellectual property and international business. Small business and startups — Retaining our firm is like having a general counsel for your small business without the in-house cost. We take a personal interest in the success of our entrepreneurial clients and provide them with reliable counsel on reasons why and how to start a business in Arizona, as well as practical advice for buying or selling a business. Formation, operations and dissolution — We can help you choose whether to form an LLC, C-Corp, S-Corp, partnership or other entity. We can draft your sales and distribution agreements as well as manufacturing and employment agreements. When your business has run its course, we help you dissolve the entity cost-effectively and in compliance with state and federal law. Strategic planning and asset protection — We counsel business owners to avoid pitfalls, such as working beyond their means, and encourage detailed organizational engineering, which includes protection of personal wealth and business assets from liability and taxation. Litigation — We handle every type of business and corporate dispute, including stockholder, partner and franchise litigation through traditional negotiation, alternative dispute resolution and trial. At our firm, we do more than connect the dots for businesses — we create the dots. 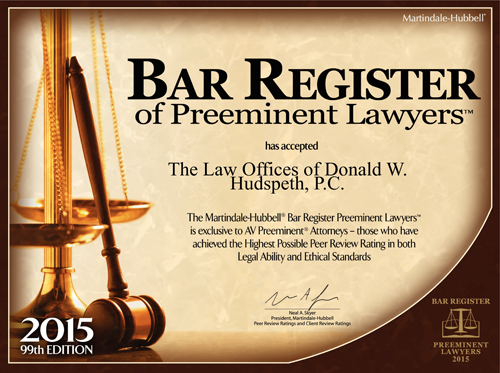 Law Offices of Donald W. Hudspeth P.C., works with business owners throughout Arizona and extends to other states such as California, New York (City), Michigan, Florida, Oregon and Washington. In addition, we are in at least 15 countries, including Canada, Israel, Iceland, Sweden, China, Australia, Korea, Mexico, Ukraine and Uganda. Whether you are forming a business, negotiating a contract or litigating the terms of one, our firm is experienced and can service your needs. 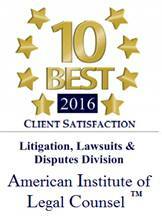 If you need talented and experienced business attorneys, call us at 602-265-7997 or contact us online at TheFirm@azbuslaw.com. Located in midtown Phoenix, our firm is easily accessed either by light rail or car, with plenty of available parking.